Jay Merrick tells the story of rescuing Dunoon’s Burgh Hall from demolition and how it will impact on the revival of this once successful seaside town. On June 23rd 1874, readers of the Glasgow Herald would have noticed a news story beneath a less than dynamic heading: DUNOON BURGH BUILDINGS. It announced the opening of the Burgh Hall at the corner of Argyll Street and New Road in Dunoon, on the Cowal peninsula in the Firth of Clyde. It was, said the report, a “capacious building” designed in the Scots baronial style by the Glasgow architect, Robert Bryden. 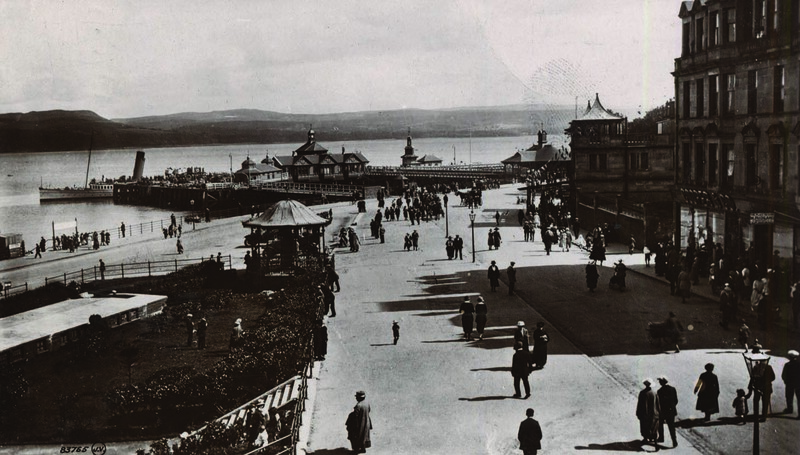 The considerable success of the town between the late 19th century and the 1950s was essentially a by-product of the original industrial might of Glasgow and its once massive shipbuilding and manufacturing workforces, for whom holiday breaks “doon the watter” were a crucial release from heavy, but relatively well-paid, toil. In 2008, the Burgh Hall stood empty, and in a serious state of disrepair – an apparently doomed relic of Dunoon’s past. Why? Because, by the 1970s, the shipbuilding industry had virtually collapsed, and European package tourism had robbed Dunoon and other small seaside towns on the so-called Costa del Clyde of most of their visitors. There was one major, but temporary, reprieve. The presence of the US Navy’s Polaris and Poseidon submarine refit base at nearby Holy Loch between 1962 and 1991 bolstered Dunoon’s prosperity. The 4,000 service personnel and their families almost doubled the local population and contributed $20m to the local economy; sailors bought tweed deerstalkers at Bell’s of Dunoon, and travelled to and from Holy Loch in one of the 130 local taxis. But when the Americans left, the local economy deflated, and has remained relatively strained since then. 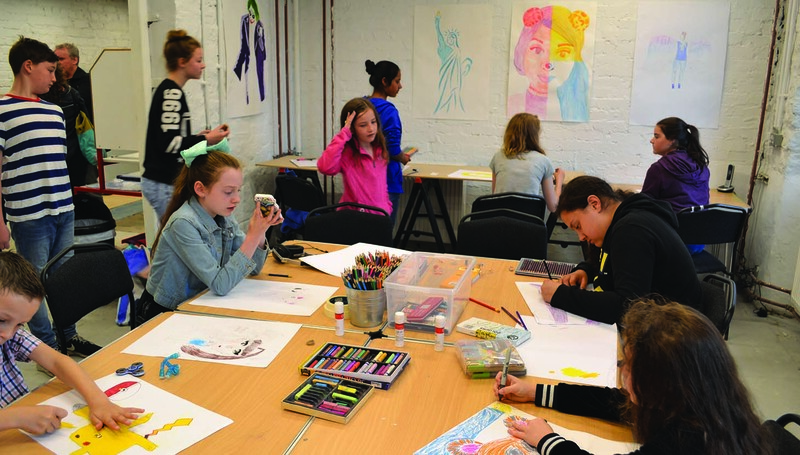 The resurrection and reinvention of the Burgh Hall over the last 10 years as a community arts centre has produced a focal-point in the town designed to attract visitors, unlock local creative energies, and stimulate the town’s economy. McAslan’s international practice has delivered award winning adaptive re-use and modernisation projects involving historically significant buildings, such as King’s Cross Station and the Roundhouse in London, and Bexhill’s De La Warr Pavilion. He knew the Burgh Hall was a wreck. But he also knew that arts-led projects in small, socio-economically deprived towns such as Margate and Bridlington, often triggered creative regenerations. The transformed Dunoon Burgh Hall is complete with a bright and welcoming café as well as spacious workshops for a variety of bespoke learning programmes – an innovative, community-led cultural and social asset for the town and the region. He believed that the Burgh Hall could be an agent for new creative activities on the Cowal peninsula and, in September 2008, he met an enthusiastic local pro-Burgh Hall group led by the ebullient local agitator, Dave McEwan Hill, and the locally-based novelist and historian Sir Charles Maclean. The imperative was to get the building back in temporary use by making it wind- and water-tight. An open day was the project’s starting-gun, attracting 3,500 local people – three-quarters of Dunoon’s population – and generating a permanent floating group of about 40 volunteers, originally led by Colin Macpherson, a local hotelier. Their efforts have been central to creating the sense of ‘local ownership’ of the Burgh Hall, and the activities it has generated. 2012 was a crucial year for the project. The John McAslan Family Trust, which had funded the early start-up activities, transferred the ownership of the Burgh Hall to the newly established charitable Dunoon Burgh Hall Trust (DBHT), which developed a business plan; McAslan remained centrally involved. Even before then, the Burgh Hall’s core team had developed a programme of arts events – local and imported – held at the temporarily repaired hall from 2010. Among the ‘headline’ events were a visit by the Rambert Dance Company, the now annual Dunoon Film Festival, and an exhibition of Robert Mapplethorpe photographs from the £100m ARTIST ROOMS collections established by one of Britain’s greatest modern art dealers, Anthony d’Offay. All this in a town with a population of fewer than 8,000 people – though with an impressive roll-call of eminent sons and daughters; among them, the Labour Party leader, John Smith, the former NATO Secretary General, Lord George Robertson, the Oxford professor of sociology, Doreen McBarnet, and the Sinologist, Prof Ian Gow. The key, according to McAslan, was “getting the building back in use as quickly as possible to build support, and to gain visibility and momentum”. The first event, a Hogmanay Hootenanny at the Burgh Hall in 2010-11, was organised by Liz Miller. There were 100 people and three bands in the main hall, school furniture, a kitchen that wasn’t a kitchen, a makeshift bar. We made it up as we went along – a case of, if we stick everything together, they will come.” To date, the Burgh Hall team, led by Ann Campbell and arts programmer, Jenny Hunter, has raised more than £3m to fund the future administration, programming, and maintenance of the Hall. These demonstrations of the Burgh Hall Trust’s energy, forward-planning, and cultural ambition triggered additional project funding from the Big Lottery Fund Scotland, Heritage Lottery Fund, Creative Scotland’s Large Capital funding programme, Historic Scotland, the Monument Trust, Highlands & Island Enterprise, and the McAslan Family Trust. The Glasgow architects, Page\Park, were appointed to design and deliver the transformed hall. The exterior of the building, in the Scots Baronial style, is faced with blocks of rough grey schist and smooth sandstone, giving the misleading impression that it was impressively solid. It wasn’t. A great deal of remedial work was necessary: replacement of loose or defective roof slates and leading; re-pointing; removal of patches of defective stonework; re-bedding loose or cracked stonework; skilled repairs of carved stone; renovation or replacement of cast iron gutters and downpipes; and the renovation and re-setting of doors and windows. The biggest challenge was the roof. There were cost restraints, and so it was repaired and strengthened – the original trusses had moved or were split – rather than replaced. Interventions using lightweight steel elements solved these problems. There were other issues: serious rising damp in parts of the interior; plaster falling off walls because it hadn’t been properly tied in originally; the heating system had to be modernised; and the interior’s key historic features required detailed renovation. These interventions have brought the Main Hall back into full use, created an elegant new stepped and ramped granite approach in Argyll Street, and reconfigured the ground floor to make clarified gallery and back-of-house spaces, and a much more welcoming reception area. Additions to the building include a glazed external extension of the cafe area, with a landscaped garden. The official reopening of Dunoon Burgh Hall by first minister Nicola Sturgeon in late June was preceded by its most ambitious art event to date – an exhibition of the work of Andy Warhol drawn from the ARTIST ROOMS resource. 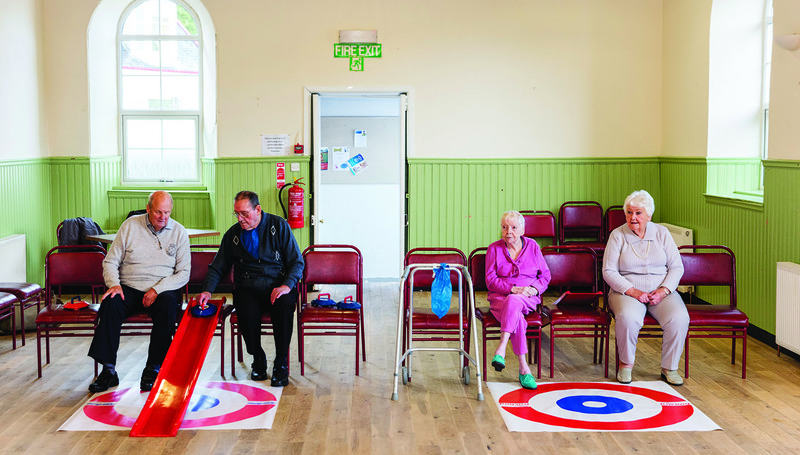 The forward programme includes exhibitions, a film festival, the fifth Dunoon Film Festival, numerous musical events, talks, theatre and associated activities. Dunoon in the 21st century is overlaid with the ghost of a town which, in 1885, possessed two banks, 21 insurance agencies, 10 hotels, a gas company, two bowling greens, three weekly papers, the West of Scotland Convalescent Sea-side Homes (complete with Romanesque hydropathic spa) and the lavishly appointed second homes of some of Scotland’s most successful people. The revived Burgh Hall has the potential to generate a very different kind of pulling-power based on the increasing public appetite for art.